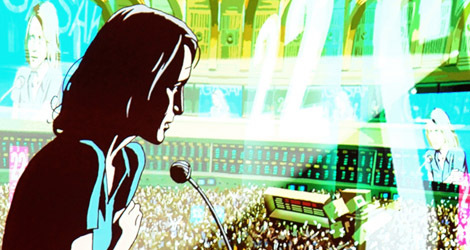 At the end of Ari Folman’s Waltz with Bashir (2008), the animation suddenly gives way to photos of the Sabra and Shatila massacre during the Lebanese civil war. With his latest effort, this Israeli filmmaker with a Polish passport has split his movie into two almost equal parts, one live action and the other animated. The latter part of the movie was partially inspired by the science fiction of Polish author Stanisław Lem. Kongres recounts the chimerical journey of Robin Wright playing the role of a fading actress with a sick child who is eventually convinced by her agent, Al (Harvey Keitel), to sell the rights to her image to a big studio. Her features are then digitally scanned and an avatar of her is created for use as an infinitely adaptable virtual actress. The, somehow abrupt, transition to animation takes us 20 years into the future. Before embarking on a hallucinatory trip, Robin is called back by fictional studio Miramount to take part in a congress attended by actors who have been turned into animated avatars. Filmed in the United States, animated in France and post-produced in Poland, Kongres is anything but banal as a reflection on acting in digital age. The collaboration between Folman and Polish cinematographer Michał Englert for the first part of the movie should be the first step on the road to a more solid artistic partnership. Nevertheless, the hard landing Folman bludgeoned audiences with in his previous movie is certainly more striking and profound than the hybrid, dreamlike pillow offered in this co-production.